Award-winning chef-restaurateur, cookbook author, and television personality Rick Bayless has done more than any other culinary star to introduce Americans to authentic Mexican cuisine and to change the image of Mexican food in America. Rick is fourth generation in an Oklahoma family of restaurateurs and grocers. From 1980 to 1986, after studying Spanish and Latin American Studies as an undergraduate, and doing doctoral work in Anthropological Linguistics at the University of Michigan, Rick lived in Mexico with his wife, Deann, writing his now-classic Authentic Mexican: Regional Cooking From The Heart of Mexico (William Morrow, 1987). The New York Times’s legendary Craig Claiborne hailed this work as the "greatest contribution to the Mexican table imaginable." In 1996, Rick Bayless's Mexican Kitchen: Capturing the Vibrant Flavors of a World-Class Cuisine (Scribner) won the IACP National Julia Child “Cookbook of the Year Award”. The New York Times praised him as a writer who makes "true Mexican food user-friendly for Americans," and Time Magazine hailed him as a "cookbook superstar." Rick's cookbook Salsas That Cook (Simon & Schuster), written with his wife, Deann, and JeanMarie Brownson, was published in 1999. At the 2001 James Beard Awards (the culinary equivalent of the Oscars), Mexico–One Plate at a Time, (Scribner) companion to the first season of the Public Television series by the same name , was singled out as the “Best International Cookbook”. In 1987, Rick having moved to Chicago, opened the hugely successful Frontera Grill, which specializes in contemporary regional Mexican cooking. Still today it remains one of Chicago's hottest dining spots. In 1988, Food & Wine Magazine selected Rick as "Best New Chef of The Year," and in 1991, he won a James Beard Award for "Best American Chef: Midwest." In 1995, he won another James Beard Award for "National Chef of the Year" as well as an award for "Chef of the Year" from the International Association of Culinary Professionals (IACP). In 1998, the Beard Foundation honored Rick as "Humanitarian of the Year." 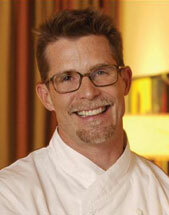 In 2002, Bon Appétit honored him with the “Cooking Teacher of the Year Award”.